Khan al-Ahmar and Abu Nuwar villages are home to around 2,000 Bedouin residents. Israel wants their land for exclusive Jewish development. Displacing their residents and stealing their land will divide the West Bank in two, isolating one Palestinian part from the other – driving a final stake through the heart of a two-state solution Israel rejects despite falsely claiming otherwise. Both villages are targeted for destruction and displacement of their residents. On September 5, Israel’s High Court approved Khan al-Ahmar’s demolition after earlier suspending it. The village connects East Jerusalem to the Jordan Valley. It’s located between Maale Adumim and Kfar Adumim settlements Israel intends expanding by stealing Palestinian land. It’s how the West Bank and East Jerusalem have been colonized since June 1967 – after Israel stole 78% of historic Palestine in 1948. “A blatantly immoral decision, submissive but definitely in the spirit of the new commander: Ayelet (“little snakes”) Shaked” – Israel’s so-called justice minister. 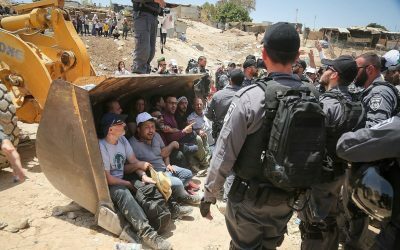 Israel wants Khan al-Ahmar and Abu a-Nuwar residents forcibly moved about seven miles from their villages – intending to relocate them adjacent to a landfill, the area unsafe for human habitation. On September 27, the Netanyahu regime declared Khan al-Ahmar a closed military zone, one of many ways it uses to steal Palestinian land. Soldiers prevent Palestinian activists, journalists, and human rights workers from entering the village. Days earlier, Israel’s Civil Administration ordered village residents to demolish their own homes and other structures, demanding they leave by October 1. Destroying Khan al-Ahmar village is an Israel high crime of war and against humanity, repeated countless times before since the Nakba. “A. Parties to an international armed conflict may not deport or forcibly transfer the civilian population of an occupied territory, in whole or in part, unless the security of the civilians involved or imperative military reasons so demand. Nuremberg Principles and Fourth Geneva (Article 49) prohibit forcible displacement of civilians from occupied territory, calling the action a war crime. Israel does what it pleases because of full US support and encouragement. It regimes intend confiscating all valued parts of historic Palestine they want for exclusive Jewish development. The international community is doing nothing to challenge its ruthless policies.